Celebrate Seniors Month was officially opened on Tuesday the 1st of October at the Civic and Arts Centre. Master of Ceremonies Karen Lock welcomed those attending. John Mullins was in charge of sound and lighting. The Glady’s Smith Early Learning Centre children performed a group of songs and were assisted by Mrs Joycelin Walker on piano. They all sang very well and they were so cute. There were about 12 songs in all that they sung. These children are between the ages of 3 to5 years. Wattle Range Council Mayor Peter Gandolfi officially opened seniors’ month and recognized everyone who made it possible. Mr Gandolfi thanked the origination Committee Catrina Santos, Nan Jarrod, Milton Parrish, Sue Humphries, Ern Bently and Deb Cavanagh as well as the Millicent Lions club and Library friends for the time they gave in setting up for the day. Senior month continued with film afternoons, bus trips, and lunches. 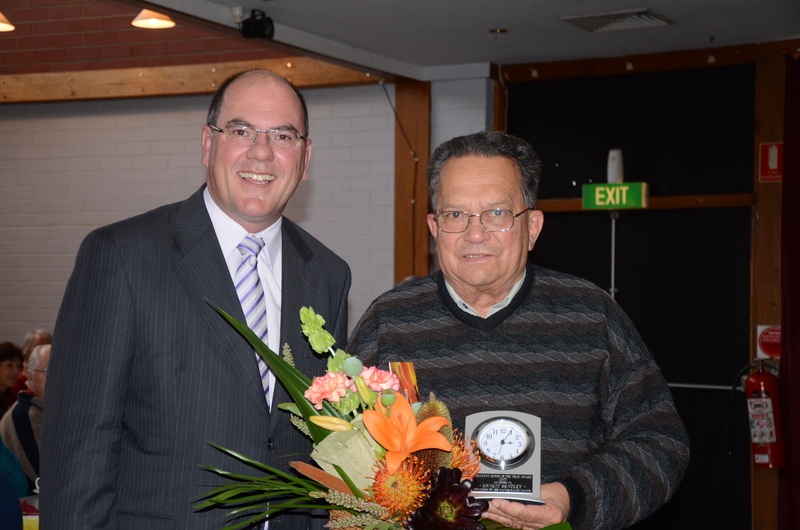 Wattle Range Mayor Peter Gandolfi presented Senior Citizen 2013 Ern Bently with his Award. Presentation of the senior of the year award was held at the Millicent & District Community Club on October 29th and was attended by about 70 people. 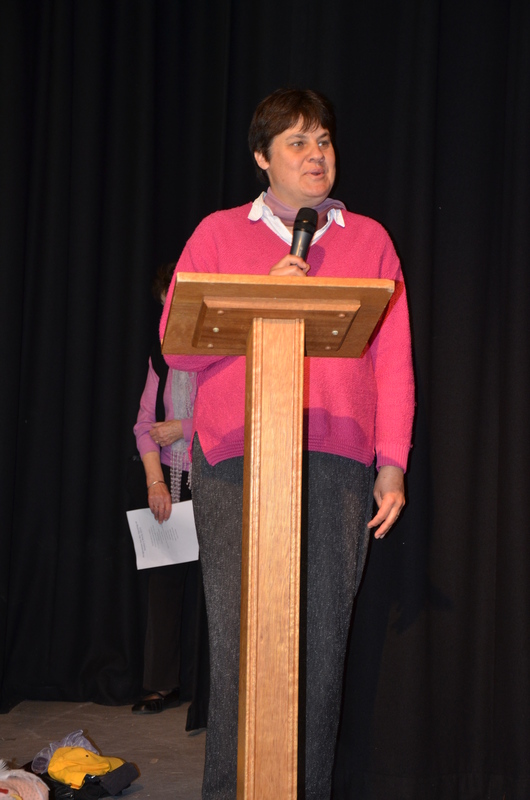 Everyone was welcomed by Caterina Santos from Wattle Range Council who also played a major role in senior month. The entertainment consisted of the Choral Society singing a few songs to start the afternoon. While afternoon tea was served music was provided by Ian Ross and Ian Chambell. To be selected as senior of the year you first have to be nominated. When seniors are carefully chosen for this award they don’t know that they are even a contender for the award. The committee looks at what contribution that the person has put into the community over the years. When organising an event like senior Month it takes a few months to plan and establish. Wattle Range Council mayor Mr Peter Gandolfi presented the senior of the year award .This year’s winner was Mr Ern Bentley. Mr Bentley is a Laver Preacher at the Millicent Uniting Church and conducts Baptisms and Funerals; he is chair of the Uniting Church Council. The Uniting Church has not a resident minister for approximately the last 7 to 8 years, so he was willing to step up and help out. He conducted the Bless of the Fleet at Beachport. Mr Bently leads training sessions for condergration, takes services at Penola & Lucindale for the Uniting church, and supports the combined church fates. He is currently the president of the men’s probes club in Millicent. He is a part of the senior committee and the men’s shed and was furthermore a volunteer Ambulance Officer for 25 years and now tutors maths students at Millicent High school. Ern won an Australia Day award in 1994 and he is a mentor for Flinders Medical students to help them feel a part of our community. He is a meal on wheels volunteer. Ern received flowers and a clock as his gift for the huge contribution he has made to the community. He acknowledged everyone and thanked them for this award and said he was surprised to receive it. Ern moved to Millicent in 1971 and lived in Ridge Tce when he first moved here. His wife was from Penola. He was also involved with school committees when his children were growing up and going to school. Senior month has been running for the past three years.